A laminated geotextile seaming tape for jointing Artificial grass carpets. Strong, rot resistant, impervious to moisture. Bond It Seaming Tape consists of 2 plys of non-woven fabric bonded together with a strong adhesive. The back layer has a smooth impervious surface whilst the top face has a more open structure to aid bonding to our Astro Pro Hybrid Adhesive. Bond It Seaming Tape consists of 2 plys of non-woven fabric bonded together with a strong adhesive. The back layer has a smooth impervious surface whilst the top face has a more open structure to aid bonding. 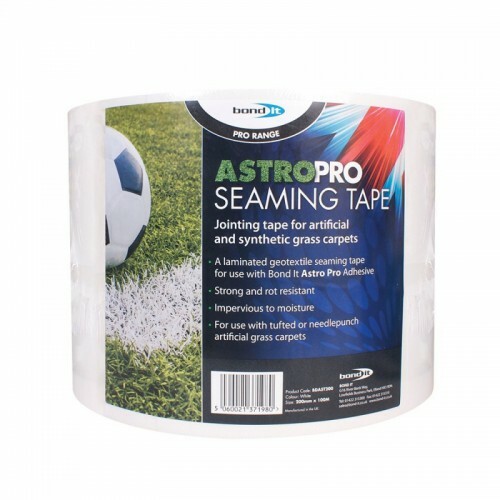 Astro Pro Seaming Tape is designed for use in conjunction with Astro Pro Adhesive and is suitable for use with all tufted or needlepunch artificial grass carpets.